Some people don’t believe depression is a real medical illness, saying it’s “all in your head.” And in a way, they’re correct. Depression is all in the head because it’s caused by changes in the brain’s chemistry. It’s a serious illness and should be treated with care. To dismiss depression as a fictional illness is both incredibly unhelpful to the person suffering as well as potentially life-threatening depending on the severity of the illness. Specifically, depression is a mental illness that interferes with a person’s life and can lead to extreme feelings of sadness and hopelessness. On top of that, it can cause a person to experience physical pain, appetite changes, and problems sleeping, among other things. It should be treated like every other illness: with best medical care available. Depression usually affects a person through their feelings, thoughts, behaviors, and even their physical health. The number of people in the United States who suffer from depression is shocking. The statistics are truly staggering. 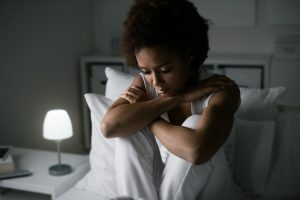 According to the U.S. Centers for Disease Control and Prevention (CDC), one in every 10 American adults has depression. The National Institute of Mental Health (NIMH) reports that 6.7 percent of American adults have a major depressive disorder. Furthermore, more than 300 million people around the world have depression, according to the World Health Organization. "The number of people with depression may be rising due to more awareness and more acceptance of depression as a disease. Major depression is more than just feeling low. It is a real disease that runs in families and meets accepted diagnostic criteria." The number of people who deal with depression on a daily basis is massive, and if we’re going to care for them effectively, we need to understand just how prevalent it is. To say that depression is purely about brain chemicals misses the complexity of the disease. Depression is often a combination of biology, emotion, and circumstances that have joined together to create a dark cloud of depression. For example, a lack of serotonin in the brain may cause depression. Hugely emotional events can trigger severe bouts of depression. A person’s emotional makeup may simply be geared toward melancholy. Effective treatment of depression recognizes that depression is usually caused by numerous factors and each factor should be treated appropriately. Depression affects the whole person and can be absolutely debilitating, leaving a person unable to function effectively. But what does depression actually feel like? If you want to help those who struggle with depression, it’s crucial to know the answer to this question. When a person is depressed and they’re not just “sad” or “feeling down.” It’s not like they just have a bit of the blues and just need to be with some friends. No, it’s much deeper and more painful than that. A depressed person often feels little to no pleasure in life. Their joy is drained. Things they once loved or people they still love may not make them feel love at all. Focusing on something can be nearly impossible, and thinking clearly is a chore. Decision making seems overwhelming at times, even if it’s something that seems simple, like “what TV show should I watch?” or “what should I eat for dinner?” For a depressed person, making these decisions are taxing. Hopelessness can also accompany depression. It can feel like there’s no way to get better, like there’s never going to be greener grass, like the sadness will last forever. This can lead to a lack of self-esteem or worthlessness. Because of this, someone who’s depressed will only see the negative aspects of herself and not all the positive elements. As if that’s not enough, sleeping can be a battle. Sometimes it’s difficult to fall asleep. Other times you’re so exhausted that you can’t even get out of bed. Add to this the general exhaustion, aches, and pains a depressed person feels and getting through a day takes everything the person has. Food is not appetizing to many depressed people. Eating becomes something they must force themselves to do. For others, it’s a coping mechanism and they end up eating too much food and gaining weight. But despite all of this, there is a light at the end of the tunnel. How Can We Help Those With Depression? There is hope and there is help. If you believe you may have depression or you know someone who might, here are some things you can do. Knowing what depression looks like outwardly is instrumental in taking the next steps toward recovery. If you don’t know what to look for, you won’t know when to step in and offer help. For example, if you or someone you know demonstrates unusually intense sadness for a lengthy period of time, that can be a strong indicator of depression. Severe depression that isn’t treated, can lead to even graver consequences. If you know that this is one of the symptoms, you can then take the appropriate steps. If you’re going to help a depressed person, there will need to be a conversation about depression. This can be uncomfortable, especially if you or they have no experience with the disease. "I’ve been feeling concerned about you lately." "When did you begin feeling this way?" "Do you think something happened that made you start feeling like this?" History tells us that treatment is the best route for recovering from depression. So gently, persistently encourage your loved one who may be depressed to seek professional treatment. You can even go a step further and help them find the treatment they need - remember, seemingly simple tasks like this that involve decision making can be overwhelming to them. Once you’ve found a doctor and scheduled a checkup, help your loved one make a list of symptoms that you both have noticed as well as questions to ask the physician. This will ensure the first doctor’s visit is as efficient and helpful as possible. The doctor may also recommend counseling or Cognitive Behavioral Therapy. If this is the case, make every effort to be supportive of them. How Do Doctors Treat Depression? There a many routes a doctor may take to treating your or your loved one’s depression. It often depends on the person’s characteristics and symptoms, and treatment can involve everything from medication to behavioral changes to more natural remedies. Often, doctors will also prescribe lifestyle changes, like improving sleeping and eating habits, increased physical activity, and methods to reduce stress. These conversations are important ones to have with your doctor at the first meeting. Depression is often a long-term illness that may never go away, and learning to live with depression can be very difficult, whether you are diagnosed or someone in your life is diagnosed. During this journey, there are certain things you can say that will encourage a person struggling with depression. There are also some very unhelpful things to say. When it comes to helping someone with depression, the most important thing you can do is to just stay present in their lives. Be there for them. Stay available, literally and emotionally. Offer to help as much as you can. It may be a long road ahead, but you - whether you have depression or love someone with depression - can and will do it.